Government ownership of banks can help solve credit market failures and stabilise the supply of credit over the business cycle. However, it can also end up serving political interests and lead to a misallocation of financial resources. Çağatay Bircan and Orkun Saka provide new evidence that state-owned banks systematically engage in tactical redistribution of credit in line with the political incentives of those in power. Analysing the geographical distribution of all lending and economic activity in Turkey, they show that a central government may use commercial lending by state-owned banks to support allies and hinder opponents in local elections. The Great Recession of 2008-09 led to government bailouts of banks in Europe and elsewhere, giving rise to greater presence of state banks in the financial sector. This sparked a renewed debate over the economic costs and benefits of state bank lending. On the one hand, a large literature argues that lending by state banks is inefficient, subject to political capture, and associated with lower economic growth. On the other hand, state banks can help solve credit market failures due to information asymmetries and may bring the benefit of more stable credit over the business cycle, especially during financial crises. In a recent paper, we have studied the presence and consequences of political influence on state bank lending in Turkey over the past fifteen years. This period has been characterised by a single party in central government, which has direct authority over three state banks that operate nationally and control around a third of total banking assets. In our methodology, we use variation across provinces in political competition faced by the ruling party during local elections as well as a new quarterly dataset of bank loans to pin down the exact timing of politically induced lending. We document two sets of findings. First, state banks engage in strategic lending around local elections when compared with private banks. In contrast to earlier literature, we find that state banks curb aggregate credit in the country prior to local elections and increase it afterwards. However, this result is driven by cross-sectional reallocation of credit between constituencies defined by their political alignment and the degree of electoral competition. In particular, state banks in Turkey, when compared with privately-owned banks, lend more in provinces where the incumbent mayor is affiliated with the ruling party and faces strong political competition from opponents in the run-up to local elections. In contrast, the very same state banks instead decrease their lending in similarly competitive provinces but with an incumbent mayor from an opposition party (see Figure 1). 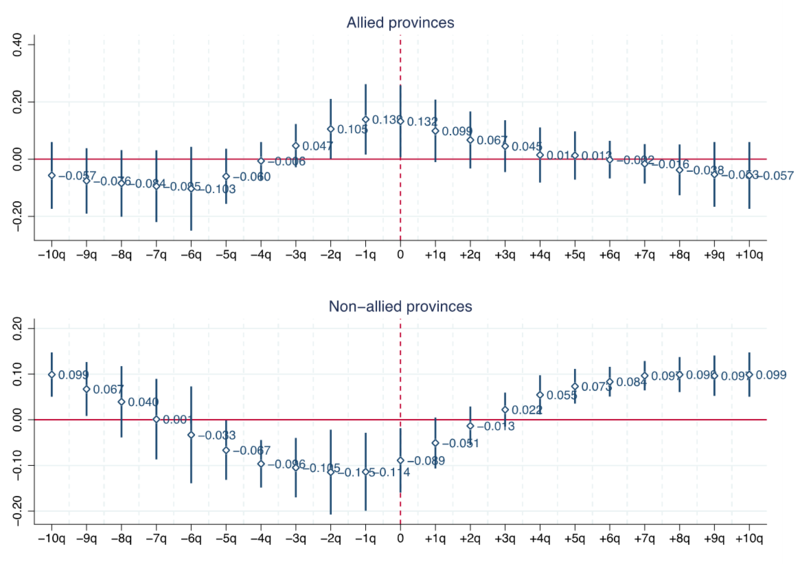 Note: The figure shows results from a triple difference-in-differences regression estimated on quarterly bank credit data by bank type and province. Each plotted coefficient comes from a single regression; bars around estimates show 90% confidence intervals. Estimates are reported separately for politically aligned and non-aligned provinces in each panel. The red dashed line represents the local election quarter. For more information, see the authors’ accompanying paper. Both effects (the relative increase in state-bank credit in allied regions as well as the decrease in opposition regions) arise only prior to the dates of local elections and peak either on the exact election quarter or one quarter earlier before quickly dissipating after the election. This lends support to theories of tactical redistribution, which predict that governments use public resources (in this case, lending by state-owned banks) as a strategic tool for re-election purposes. Consistent with the argument that local politicians are usually judged by local economic performance, we find that the credit cycle is mainly driven by corporate lending, while it does not appear in consumer credit. This is consistent with the idea that voters, who have imperfect information about the drivers of economic growth, attribute fluctuations in economic performance mainly to the incumbent mayors. Thus, our findings suggest that, by strategically redistributing corporate credit prior to elections, politicians indirectly target the creation of jobs and investment to increase the electoral chances of their own mayoral candidates. These systematic divergences in lending practices across provinces imply that governments may exert influence over state-owned banks to shape the geographical distribution of credit in line with the ruling party’s objectives. This reallocation may have real consequences if borrowers are unable to switch lenders, meaning that politically induced lending might alleviate credit constraints in aligned provinces and exacerbate them in non-aligned provinces. Our second set of findings provides evidence that local economic activity is influenced by this reallocation. We draw on administrative data collected from every formally registered firm in Turkey and aggregated to the industry and province level to document these findings. In particular, industries with a high share of state bank lending located in politically contested provinces experience substantial reductions in employment, sales, and assets in the run up to local elections if the incumbent mayor is from an opposition party. We find the exact opposite patterns for provinces if the incumbent mayor is from the ruling party. In line with the interpretation that this reallocation of economic activity is driven by the political lending cycle, we find that credit extended to the corporate sector follows the same pattern. Businesses in politically non-aligned provinces appear unable to switch lenders around local elections and suffer financial constraints, especially in their access to longer term credit. In contrast, businesses in provinces that are aligned with the ruling party have easier access to credit in the run-up to local elections. Does politically induced lending lead to a misallocation of resources? Our results show that credit growth in the run-up to a local election suffers in opposition provinces especially in industries with initially higher efficiency, as measured by their return on assets. As industries respond to tightening financial constraints by shedding employment and assets, politically induced lending potentially gives rise to long-lasting adverse effects on aggregate productivity and growth in these regions. We also find evidence that voters respond to the changes in economic activity, especially in terms of manufacturing employment in the run-up to local elections. This implies that, despite the potential distortionary effects of the lending cycle, such policies may eventually resonate well with electorates. These findings have important implications for the role of state ownership in banking. In particular, central governments in emerging democracies such as Turkey’s have strong incentives to influence real economic activity via state-bank loans to support political allies or hinder opponents. Such distortionary effects may increase economic inequality and create structural divergences across regions with different political preferences. In the absence of appropriate checks and balances, the costs of being on the wrong side of those in political power potentially outweigh the benefits from greater stability in lending during crises. Çağatay Bircan is a Principal Economist at the European Bank for Reconstruction and Development. Orkun Saka is a Postdoctoral Research Fellow at the London School of Economics and Political Science.